Nutrition Mission™ is an accredited continuing professional education provider with the Commission on Dietetic Registration. Please contact us for more information on our live seminars, online webinars, phone collaborations, and home study courses. Contact us now! Functional Nutrition Approaches to Gut Health. Approved for 20 continuing education credits for Registered Dietitians & DTRs. ALSO approved for 20 credits for nurses and nurse practitioners by the Florida Board of Nursing. Be sure to use our special code bd11guthealth for $225 off! A 150 question exam will provide 25 credits. The book itself is 428 pages. The test will be delivered electronically via email or fax, and test answers must be returned electronically. Invoices will be sent via Paypal and can be paid with a credit card or Paypal account (account not required for payment). The book will be mailed out within 1 business day of paid order. This course is available until May 2016. Please contact Beth for more information. Ross, J. 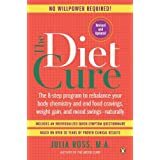 The Diet Cure: The 8-Step Program to Rebalance Your Body Chemistry and End Food Cravings, Weight Gain, and Mood Swings--Naturally. New York, NY: Penguin Books; 2012.